Researchers at TU Wien have succeeded in developing a method for the controlled manufacture of porous silicon carbide. Silicon carbide has significant advantages over silicon; it has greater chemical resistance and can therefore be used for biological applications, for example, without any additional coating required.Extremely fine porous structures with tiny holes – resembling a kind of sponge at nano level – can be generated in semiconductors. This opens up new possibilities for the realization of tiny sensors or unusual optical and electronic components. There have already been experiments in this area with porous structures made from silicon. To demonstrate the potential of this new technology, a special mirror that selectively reflects different colors of light has been integrated into a SiC wafer by creating thin layers with a thickness of approximately 70nm each and with different degrees of porosity. “There is a whole range of exciting technical possibilities available to us when making a porous structure with countless nano holes from a solid piece of a semiconductor material,” says Markus Leitgeb from the Institute of Sensor and Actuator Systems at TU Wien. This can be very useful in sensor technology – for example, the refractive index of tiny quantities of liquid can be measured using a porous semiconductor sensor, thus allowing a reliable distinction between different liquids. Another attractive option from a technical and application-oriented perspective is to first make certain areas of the SiC wafer porous in a highly localized manner, before depositing a new SiC layer over these porous areas, and then causing the latter to collapse in a controlled manner – this technique produces microstructures and nanostructures which can also play a key role in sensor technology. However, in all these techniques it is crucial that the appropriate starting material is selected. “Until now, silicon has been used for this purpose, a material with which we already have a lot of experience”, says Professor Schmid. Silicon also has significant drawbacks, however; under harsh environmental conditions, for example in extreme heat or in alkaline solutions, structures made of silicon are attacked and rapidly destroyed. Therefore, sensors made of silicon are often not suitable for biological or electrochemical applications. For this reason, at TU Wien, attempts have been made to achieve something similar with the semiconductor silicon carbide, which is biocompatible and considerably more robust from a chemical perspective. Some special tricks were required, however, in order to produce porous structures from silicon carbide. First, the surface is cleaned, and then partially covered with a thin layer of platinum. The silicon carbide is then immersed in an etching solution and exposed to UV light, in order to initiate the oxidation processes. This causes a thin porous layer – initially 1μm thick – to form in these areas that are not coated with platinum. In this way, it was possible to produce a complex layered structure of silicon carbide layers with higher and lower levels of porosity, which is finally separated from the bulk material by applying a high voltage pulse. 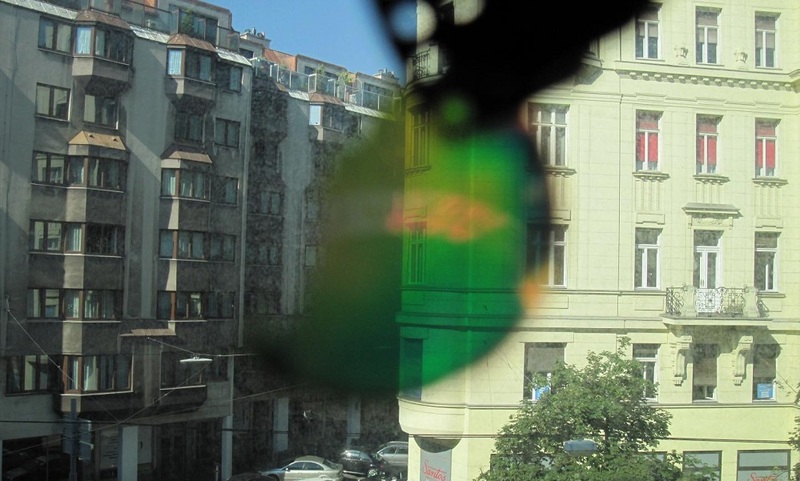 The thickness of the individual layers can be selected such that the layered structure reflects certain light wavelengths particularly well or allows certain light wavelengths to pass through, resulting in an integrated, color-selective mirror.